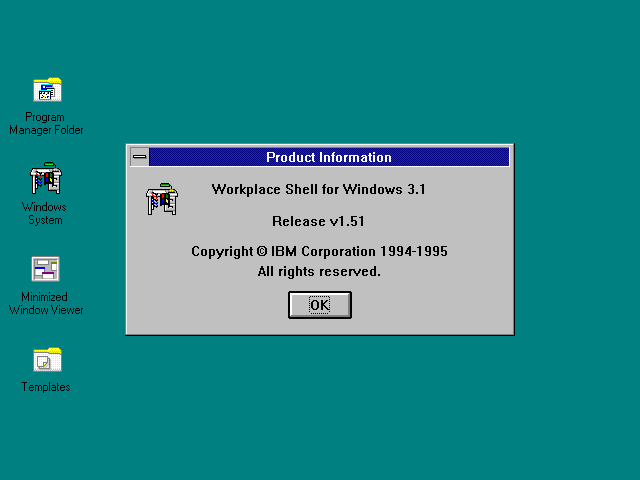 The Workplace Shell for Windows is a piece of freeware written by IBM employees that attempts to duplicate the OS/2 Workplace Shell on Windows 3.1. This is not an official product and is not directly supported by IBM. 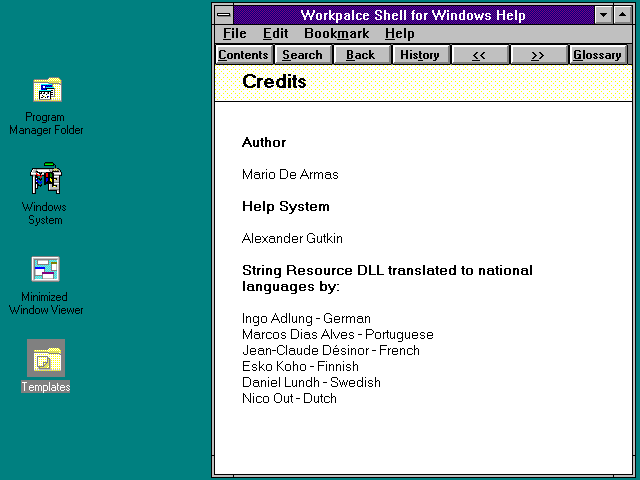 It was created because people might find it useful if they used OS/2 and also had to use Windows 3.1, or for people who just wanted to learn about the OS/2 Workplace Shell without having to install OS/2. This is the default desktop and shows the product information dialog. 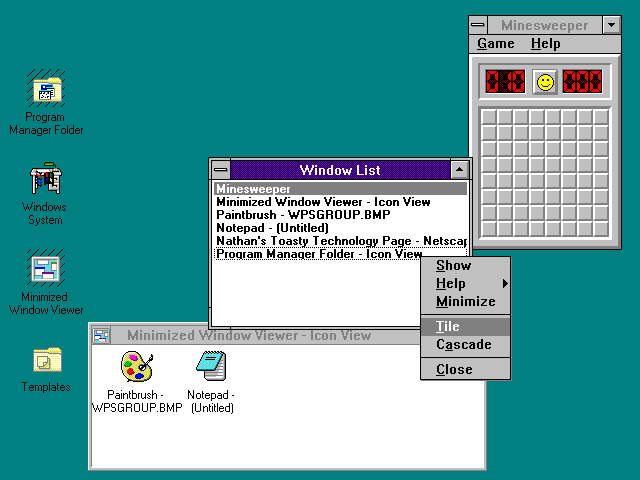 WPS makes itself the default shell rather than Program Manger, and changes the Windows color scheme to fit in with the 3-d controls. 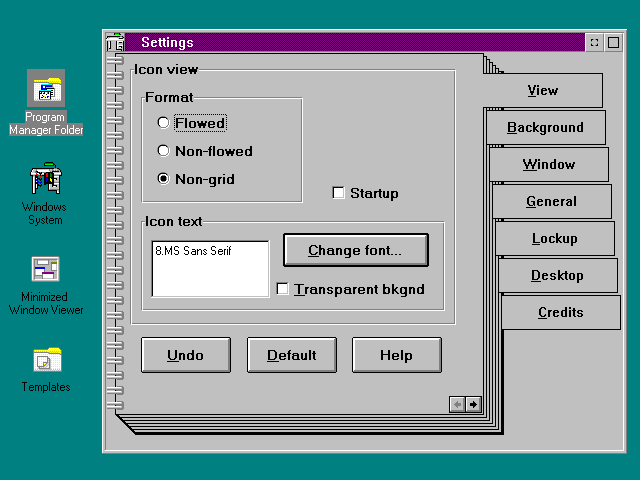 At the time OS/2 already had 3-d dialogs, menus, option boxes, and check boxes while Windows 3.1 was still using flat black and white 2-d controls for everything except buttons. 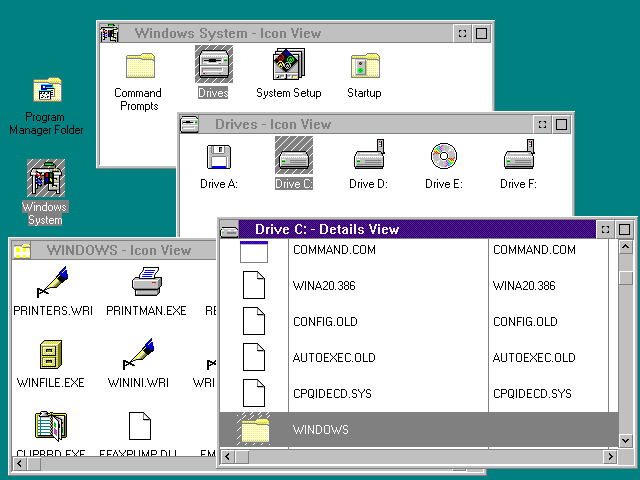 The Command Prompts Folder was more important in OS/2 where there was a DOS command prompt, OS/2 command prompt, and various custom VDM DOS environments. Many advanced OS/2 operations had to be run from a command prompt. 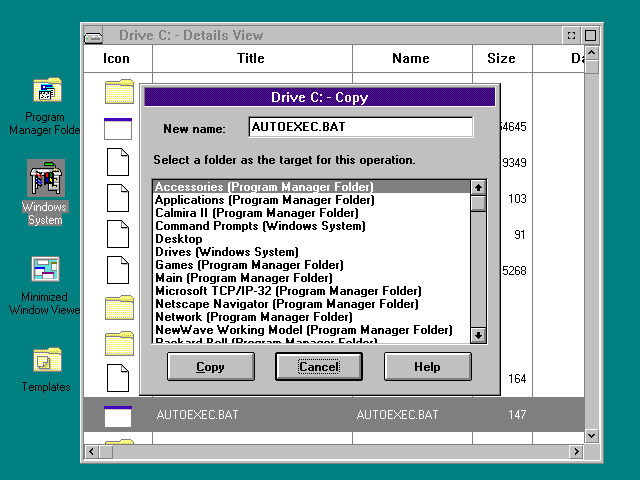 The Drives folder contains icons for each drive on the system. 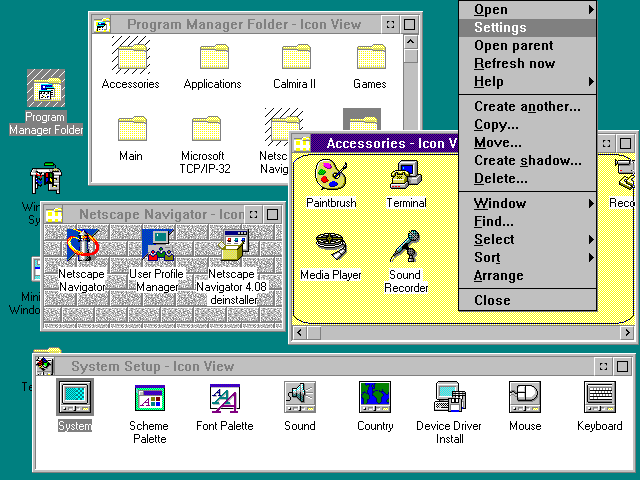 System Setup is the OS/2 equivalent of the Control Panel. The system settings icons (shown below) just map to the Windows Control Panel items. Startup will start up any applications that are copied in to it. File folders can open as either large icons or a list. For some reason that is not clear to me (other than OS/2 did it), dragging icons is done with right mouse button. Also, right click context menus are used as the only way to access many important operations. A typical Windows users or Mac user probably would find this environment very confusing. The Program Manger Folder contains a copy of the program groups that were in the Program Manager. The folders can be rearranged, placed inside other folders, and otherwise customized. A very cool feature of the Workplace Shell is the ability to set the background of each folder to a custom color or graphic. Unlike current versions of Windows Explorer, it will remember the setting even after opening a bunch of other folders, and it doesn't need a an HTML renderer to do all of that. Workplace shell for Windows alters the way minimized programs are displayed. Instead of displaying them at the bottom of the screen they appear in the "Minimized Windows Viewer" folder. Experimenting a little shows this doesn't seem to work reliably. Some minimized application will show up in the "Window List" dialog but not the minimized window folder. WPS also draws its own windowing controls for its folder windows. This does not affect how regular Windows applications appear or behave. The templates folder contains template icons that can be dragged and dropped to create new instances of files or object types. The Data File and Program templates are basically like templates for shortcuts. The desktop is not a real folder and as such can not contain files directly on it. The data file template can be used to create shortcuts to applications or documents that are visible in a desktop or a desktop folder. Because these shortcuts are not actually files they can be given long descriptive names. One of the templates can be used to create a "shredder" on the desktop or in a folder. A shredder basically behaves like a Trash or Recycle Bin icon, except files are deleted immediately. 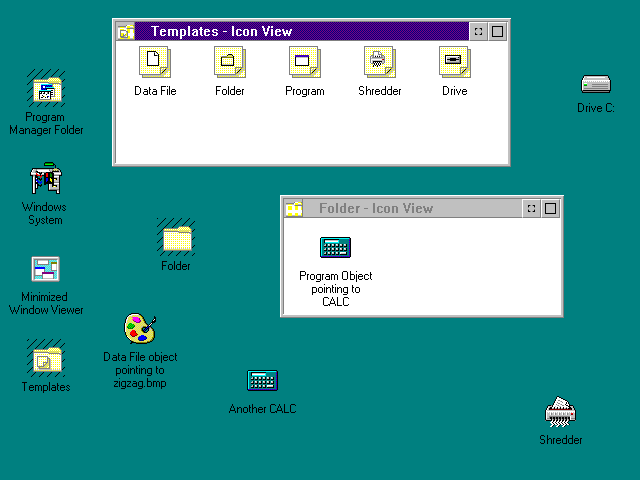 An interesting user interface feature brought over from OS/2 is the tabbed settings dialog. These dialogs mimic a notebook with tabs on the side. WPS also includes a help system in standard WinHelp format. The file management in Workplace Shell for Windows is vaguely usable but it seems incomplete in places. For example there seems to be no "rename" option for renaiming files. Also the copy function only creates a shortcut to the file in a desktop folder. Even exiting requires using the right-click context menu. 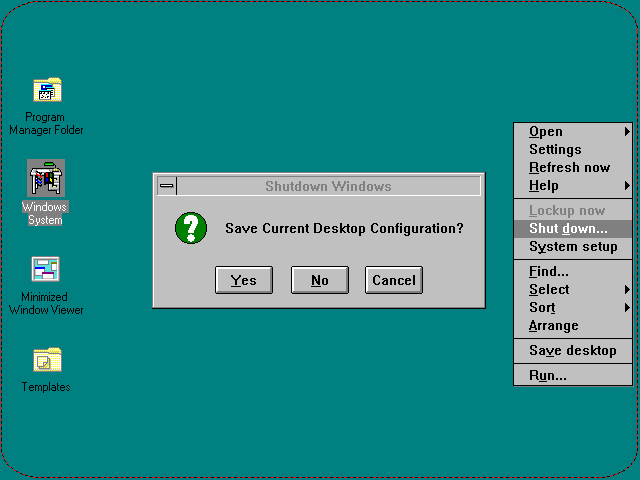 The option to exit is called "Shut Down" even though it just exits Windows to DOS. Under real OS/2 this option would actually shut down the system.